Kids these days talk about “memes.” That’s what they call a topic that they all know about. It helps with conversation, apparently. Back in the ‘70s and ‘80s, TV commercials were our memes. I’m sure you remember plenty. “Where the beef?” (Wendy’s). “He likes it! Hey, Mikey!” (Life cereal.) “The Uncola Nut” (7-Up). One commercial that stuck with me was for a brokerage called E.F. Hutton. Who stops conversation in the stock market world these days? Who do folks treat like … well, an oracle? How about Warren E. Buffett, chairman and CEO of Berkshire Hathaway? Like the beef in 1970s hamburgers, listed corporations are becoming harder to find in the U.S. That makes it harder to find promising investment opportunities without expert help. The pressure to meet short-term earnings estimates has contributed to the decline in the number of public companies in America over the past two decades. Short-term-oriented capital markets have discouraged companies with a longer-term view from going public at all, depriving the economy of innovation and opportunity. Fewer public companies has also meant fewer opportunities for retail investors to create wealth through their 401(k)s and individual retirement accounts. You know those quarterly earnings estimates we all wait for like Christmas? They’re killing the U.S. economy. If companies must generate stellar earnings every three months, nobody can invest for the long term — unless they remain unlisted and out of our reach. For example, the other day I came across a U.S. company that has invented something so revolutionary, it could transform the entire global economy. It could increase energy efficiency and reduce carbon emissions with a small but critical tweak. But it’s unlisted, because investors’ short-term earnings requirements would have stopped it in its tracks. It’s an example of how the U.S. obsession with short-term earnings makes the entire economy “penny-wise, pound foolish” … and deprives us ordinary folk of investment opportunities. 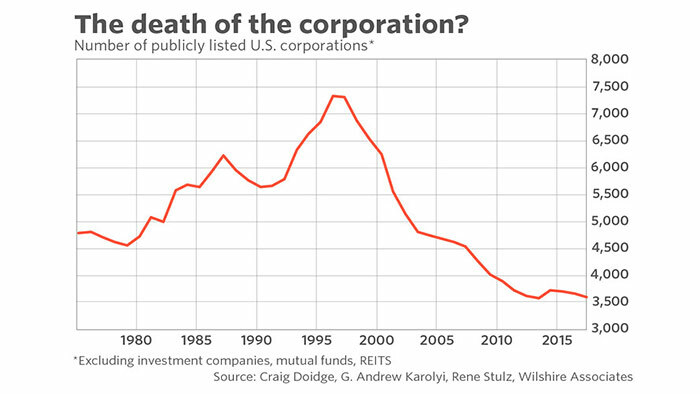 The U.S. corporation is an endangered species. In 1975, 48.5% of corporate profits came from the 100 most profitable listed firms. By 1995, that percentage had inched up to 52.8%. In the last 20 years, however, this proportion mushroomed to 84.2%. The reason? Smaller companies can’t survive anymore. The Wilshire 5000 Index includes the market value of all stocks actively traded in the United States. Back in 1974, when it was created, there were about 5,000 such stocks. Now there are just 3,599. This year, the 100 most profitable U.S. firms accounted for $1.46 trillion of total after-tax first-quarter corporate profits of $1.74 trillion. That means the remaining 3,499 companies shared just $274 billion in profit. As Buffett and Dimon note, fewer corporations mean fewer opportunities for profitable investment for everyone except deep-pocketed venture capitalists. It’s another reason why income and wealth has become so unequal in the U.S. But those opportunities are still there. You just have to know where to look. You don’t have to spend all your time ferreting out winners amongst the 3,499 companies scrapping over the leftovers of the U.S. economy. You can rely on us. It’s why Paul Mampilly, Jeff Yastine, Matt Badiali and I write newsletters. We do the legwork for you in your search for wealth. And The Bauman Letter helps you to hang onto it once you’ve got it. You could get lucky and find investments that regularly produce triple-digit gains. Or you could get smart and have us do it for you. Because the fewer opportunities there are, the more valuable expert advice becomes. Editor’s Note: Most investors search for great stocks to buy and hold, sitting on them for months or even years hoping for a big win. A while that can be incredibly profitable … many investors don’t need a windfall next year — they need one now. That’s why renowned investor Paul Mampilly is finally unveiling the exact method he used for close to 20 years … a method powerful enough to turn a $5,000 stake into $68,000 in less than two weeks. Suffice to say, Paul’s method is the true way to rapid wealth … and he’ll be going into much deeper detail during a FREE webinar presentation on June 12 at 1 p.m. EDT. But to attend, you must be signed up by tonight, June 11, at midnight … so don’t wait! To lock down your VIP spot at this online summit now, click here.